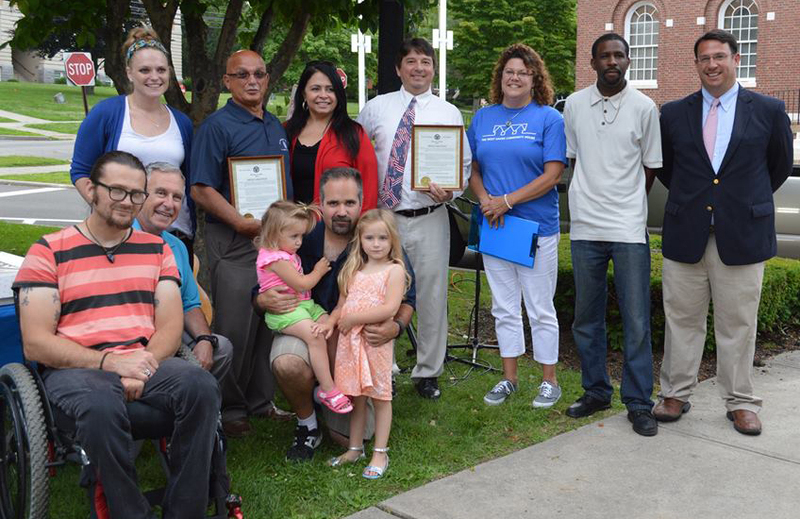 Advocates for people with disabilities, including members of the Center for Disability Rights and Milford’s CT Concerned Citizens for People with Disabilities, gathered at City Hall to celebrate the 25th anniversary of the Americans with Disabilities Act (ADA). Since President George H.W. Bush signed the ADA into law on July 26, 1990, basic access has been expanded to millions of Americans previous denied basic rights and opportunities. Interested in learning more about the ADA? Head to their official website here. You can also head over to the website for the Center for Disability Rights here and the Facebook page for the Concerned Citizens for People with Disabilities here. Happy to see our Mayor take part in this occasion! Thank you to all who volunteer to help give a voice and a lending hand to those with disabilities who can not do it for themselves. This entry was posted in News and Events and tagged ADA, Americans with Disabilities Act, Ben Blake, Center for Disability Rights, Concerned Citizens for People with Disabilities, Connecticut., Milford, Milford City Hall. Bookmark the permalink.